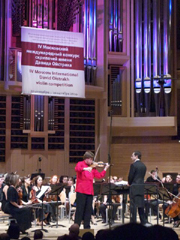 The Fifth International Violin David Oistrakh Competition is going to be held in Moscow, from 21st to 30th September, 2013. The competition is dedicated to the memory of the Great Russian violinist David Oistrakh. The purpose of the competition is popularization and development the best traditions of Russian violin performing art, discovering young talent musicians supporting them in their professional potential. The Competition has 2 age groups: Junior (10-16 y.o. ), Senior (17-28 y.o.) Most of the participants are already winners of prestigious violin competitions and they perform in famous concerts halls of the world. The applications for participation in the Fifth International Violin David Oistrakh Competition should be sent before May 31, 2013. Besides the special prizes and prize amounts (the highest prize of the Senior group is 15000 Euro), winners will get the invitation to perform on the best stages of Russia and Europe.